[14 November 2016] A final, amended version of the Codes of good practice for the Information and Communications Technology Sector under the Broad-based Black Economic Empowerment Act was gazetted and came into force on 7 November 2016. 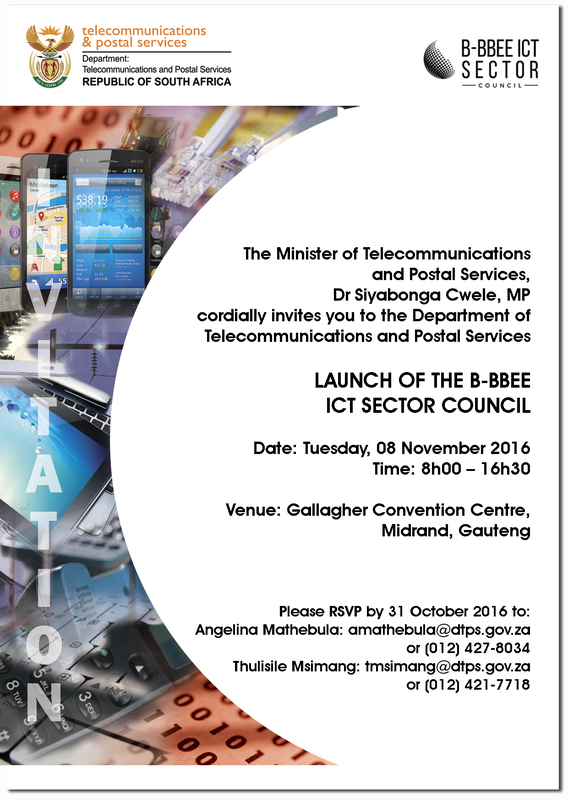 [26 October 2016] The B-BBEE ICT Sector Council will be officially launched at the Gallagher Convention Centre on 8 November 2016. [30 October 2015] The B-BBEE ICT Sector Council (established on the 23rd of September 2015) is mandated to implement and monitor B-BBEE in the ICT Sector and it has undertaken the task of aligning the existing B-BBEE ICT Sector Code with the revised Generic B-BBEE Code of Good Practise. The Department of Trade and Industry (dTi) requires this process to be completed by the end of October 2015 (failing which the sector will revert to using the generic codes). The Council has prepared a draft aligned B-BBEE ICT Sector Code which is to be published in the Government Gazette after which there will be a 60 day period for submissions by interested parties. Note that this is not the gazetted version and therefore the 60 day period has not commenced yet. The ICT Sector Code will be subjected to a comprehensive review by the end of the current financial year. 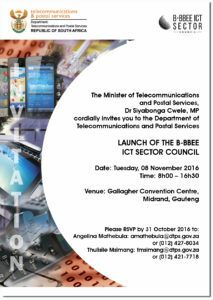 [6 June 2012] The B-BBEE ICT Sector Code has been gazetted. Comments are due by 10 August 2011.